China has installed 17 sets of submerged buoys in "key marine areas" of the western Pacific Ocean, state media said, a move that could exacerbate territorial tensions in the region. The mission carried out by the Chinese research vessel Kexue "marks the first time that China has put an array of submerged buoys on such a big scale", the official Xinhua news agency reported late Tuesday. "The buoys will provide important scientific statistics about ocean circulation and climate," Hu Dunxin, a scholar at the Chinese Academy of Sciences, told Xinhua. The vessel is expected to return to the region next month "to conduct a deep sea environment project", the report added. Beijing has regularly clashed with its neighbours in the East and South China Seas over issues of territorial sovereignty, and is increasing its naval reach into the Pacific as it expands its blue-water fleet, while the US has declared a foreign policy "pivot" towards Asia. China claims the South China Sea almost in its entirety, and its increasingly assertive stance has heightened tensions with the Philippines and Vietnam, two of the other claimants. This spring, a wave of deadly anti-Chinese riots took place in Vietnam after China deployed the giant Haiyang Shiyou 981 oil rig into waters claimed by Hanoi. Two weeks ago Beijing announced the completion of a runway for military aircraft on Woody Island, part of the Paracel chain that is also claimed by Vietnam. Vital shipping routes run through the waters of the South China Sea and they are believed to sit atop vast oil and gas deposits. 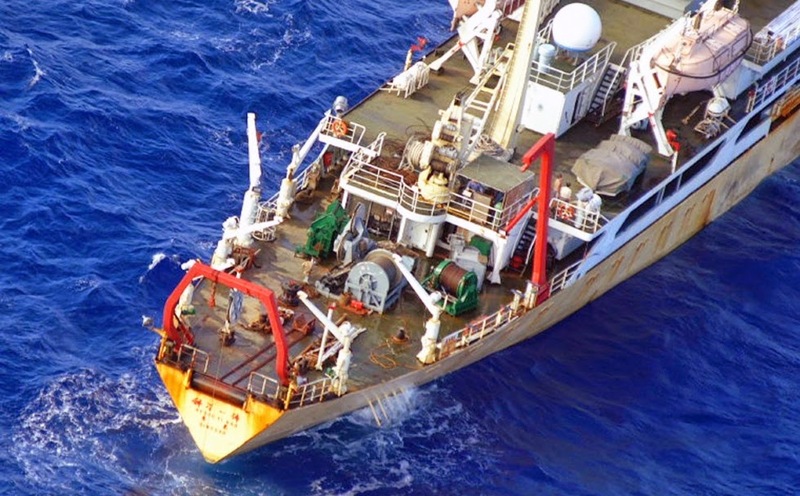 Relations between Beijing and Tokyo have plunged over their competing claims to a chain of Japanese-controlled East China Sea islands, where vessels and aircraft from both countries regularly patrol. Experts say that China is acting to assert its legal claim and practical hold over contested territory, creating so-called "incidents of sovereignty" whatever the short-term political and diplomatic costs.